There was the time my Mother, tired of our fighting, left us in the back seat of her wood-paneled Toyota Corona station wagon while she did the grocery shopping. “You two go ahead and kill eachother; I am going to do my shopping in peace,” she said. (Ah, the things you could do in 1979 without being carted off for child neglect). She walked away and my brother and I resumed our fight; a couple of buttons flew off my school uniform and a few hairs came off his head (not too many, because even then he had incredibly quick reflexes so 98% of my attempts to hurt him were fruitless). When she returned, both of us had realized the fight would go nowhere, and we were sitting quietly. And so our childhood went – fight, stop, fight, stop. For the 40 or so years we have known eachother, my brother and I have never been close. We are very different people with very different interests. During our school years, I was quiet, sedentary and eager to please my teachers, while he was athletic, fearless of authority and easily bored (a trait of the highly intelligent, I believe). While I excelled in the arts, he was a natural with numbers and had a fascination with anything driven by a motor. The day after Christmas, I would be reading books while he would be tearing his new radio-controlled car apart to see how it worked. It comes as no surprise that today, he is a mechanical engineer while I am a writer. 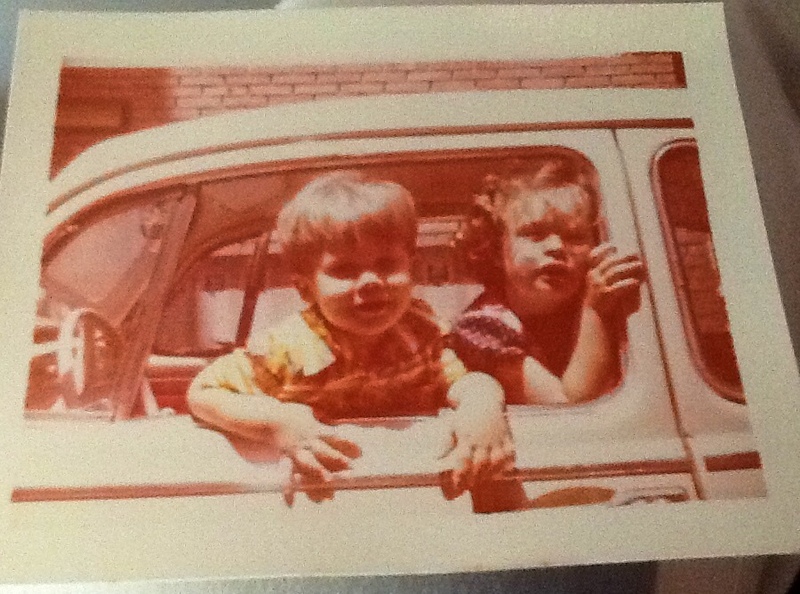 My brother and I hanging out in Grandpa’s ’66 VW Beetle, foreshadowing our driving lessons. Two times in our lives, though, my brother and I did become close – the two times he taught me how to drive. My brother had learned to drive aged 8, when he first started spending time sitting on my mother’s lap steering the car.We grew up in the perfect place to teach a child to drive – Central America, where space was plentiful, cars few and law enforcement informal. As soon as my brother reached the pedals, he started working on the relationship between clutch and trottle, and by the time we moved to Miami (1984) he could drive quite well. While most kids were trying to sneak alcohol, my brother was trying to sneak drives, counting the days until he could apply for a license. On the day he became eligible for a driver’s license, he got it, and off he went, driving as often as possible and relentlessly mastering pretty impressive car control skills in the process. Today, he is a skilled and fearless driver, which is not surprising given his talent and dedication to excel. In contrast, I also tried the sit-on-mom’s-lap routine and quickly found I was not as good as my brother, which led me to quit. Siblings never want to be eclipsed by eachother’s talent, and I was no exception. Cars could be his thing. I’d focus on school and my grades. And so it went until age 15, when shortly after I started thinking about obtaining a learner’s permit, my newly-licensed 17-year-old-friend blew a stop sign and crashed into a laundry truck. The driver she hit flew out of his car and split his head open, spilling quite a bit of blood in the process. After that, each time my mom asked whether I wanted to learn to drive, my answer was “no thanks.”And so it went for a few years. I eventually learned to drive an automatic, but it wasn’t until I purchased the cheapest car I could find – a manual 1985 Honda Civic Si – for my trip to college that I had to get serious about driving. My mother tried, but I was having none of it. She asked my brother to give it a try. My little brother turned out to be quite the instructor. Here he was, 17 years old, and he was already calm and confident in the car. There was none of mom’s stressed-out commands (“WATCH OUT! TURN HERE! NOT SO FAST!” … sorry mom, I understand now that I have kids too) or Dad’s brief and demanding instructions (“throttle. stop.left.”) My brother was patient and great at explaining driving technique, so much so that after a couple of hours he said, “go and drive,” and I fully believed I could. So off I went, stalling here and there, but I made it. A few weeks later I went off to college, fully enjoying my manual transmission, enjoying the connection to my car it provided, and on the way to becoming a car lover. And off my brother went on his own adventures, and again we didn’t see eachother much for a few years. 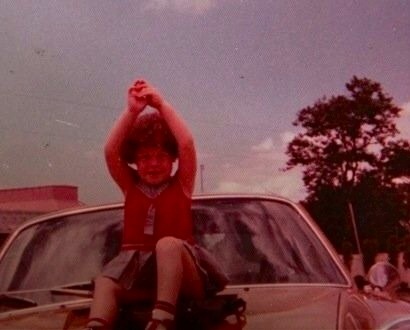 Well before my first driving lesson, when I still thought it was ok to sit on cars. Then, 15 or so years later, my father decided to get rid of his Porsche 996 Cabriolet, and in a strange moment of lunacy, I agreed to buy the car. By then I was a mother to two toddlers and hadn’t driven spiritedly for years. I had two 3-year-olds and very little time. But I got the car, and as soon as I told my brother, he said, “if you’re going to have a Porsche, you better learn to drive it right.” Before I knew it, I had joined the local Porsche Club and signed up for my first driver’s education event, with my brother — who by then was an instructor for PCA — as instructor. Once again, he sat in the passenger seat, and off we went on to the track. Once again, he was direct, clear and patient while he taught me, and when our day was done, he told me he believed I was a natural, and signed me off to go solo. “Are you sure?” I wondered, questioning whether I was ready to be out on my own on track. “Absolutely. Besides, I want to have a rum and coke, so I can’t get in your car anymore.” And again, off I went to practice what my brother had taught me. My brother’s second driving lesson brought on a period of closeness between us I loved, where we talked often and shared car-related emails more than ever before. He encouraged me to marry my two passions and write about cars. For about a year, we went to several track events together and he taught me the basics of performance driving, which I still apply every time I drive on track. And then, again, life got complicated and we went our separate ways. These days, my brother and I barely see each other for various reasons, but in my mind, we are inescapably tied together by our love of cars and the memories of the two times he taught me to drive. My brother gave me the gift of performance driving, which remains one of the greatest joys in my life. He taught me to shift, to heel-and-toe, and (tried) to teach me to brake less. He was always fearless and excellent with eye-hand coordination as a kid, and maybe he managed to pass a tiny bit of that along to me during our driving time together. Often, when I am driving well on track, I think he would be proud of me. When I see photos of his little boy, aged 5, I am reminded of my brother as a little boy, sitting on my Mom’s lap, steering the wheel of our station wagon with great intensity and focus, getting frustrated because he wanted to be the best. When I am faced with learning a new phone number, I tell people, “my brother would remember that on his first pass!” Even though I don’t see him as often as I would like, I am very proud of him and will forever be grateful of the fact that he taught me to drive, twice. More than ever I enjoyed this new blog. It really touched me deeply. It shows true experiences and feelings which are put exceptionally good on paper. Congratulations. Loved it!